Danger! This Do Not Operate tag places an important message where it matters the most. Hang this tag on any piece of equipment for an easy-to-see message. 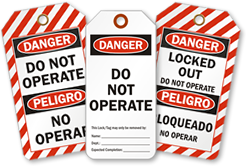 • Tags are great for identifying temporary hazards, repair and inventory information. • Tags are available in rugged, heavy-duty plastic and cardstock. • Each of these Do Not Operate tags fits over piping or equipment. • Cardstock tags have a write-on surface. Write on plastic tags with a permanent pen for better marking.